What is it about 23rd and John? And what is it that the city can even do? The speed limit is (I think) 25 or 30 for both roads. The stoplight is clearly visible and photo enforced. This isn’t like a Rainier Avenue or Aurora, these are small arterial streets. From the video it looks like people who just don’t care about stopping for red lights. I wonder why they crash more often at that particular intersection though. In most of the crashes the vehicle on 23rd seems to be at fault. Perhaps the proximity of the busy intersection at 23rd and Madison could be contributing factor to the accidents at 23rd & John. The distance between Madison and John is very short and both lights create significant delays. Southbound drivers on 23rd may be concentrating more on the light at Madison and northbound drivers may be running the light out of frustration from having 2 red lights in a short distance. I must confess to once focusing on the signal at Madison and then realizing the light at John had turned red just in time to stop. Fortunately I wasn’t speeding and could still stop at the line! This may be an example where the diagram of the cone of vision focus as a function of speed applies. If you’re doing 35+ going south bound there, you’re most likely looking further down the road at the Madison intersection. I can’t remember when the 23rd geometry changed and a lane was dropped. It may have helped. This is for 2017, not 2018. I think that a big problem is the way the signals are positioned overhead on 23rd. They need to have added signals mounted on the sides so that people see them! Overhead signals here have all sorts of problems being seen. The trees may be in the way, for example. I thought New York City congestion pricing was blocked by the state. Did the state changed its mind? Until very recently, the state changing its mind was nearly impossible because the Republicans controlled the state senate. After the 2018 elections, that’s no longer the case. At same time, congestion in New York City has gotten worse, and people have gotten more fed up with it. And the New York Subway is falling apart, and they desperately need money to fix it. Put everything together it is possible that the politics in Albany are indeed starting to change. Still, though, this is one of those things where I’ll believe it when I see it, as I’m skeptical that all the lobbyists will really allow something like congestion pricing to go through intact. The intersection design at 23rd & John is insanely stupid! The left lane is the lane cars use if they need to proceed south past Madison, only one block further. BUT, many cars turn left at John. There is no left turn lane, so they block the thru lane. It creates an incredibly dangerous weaving situation as cars weave through the intersection. To make matters worse, cars turning from the northbound lane block the view of oncoming traffic, and there are near misses every day as cars turn directly into oncoming traffic! It would be such an easy fix: just install a turn lane! 23rd now already has turn lanes from Aloha to Rainier EXCEPT at John. WHY?? Speaking of wrecks at intersections … Video of car hitting bus in Ohio on March 10th. Everyone in the car died. Everyone on the bus lived. I’d love to hear more about earlier plans for the DSTT/Metro Bus Tunnel, clearly it was designed as Bus with future rail in mind, then has been joint operation the last 10 years. What were the early rail plan assumptions, after all, they laid track into Convention Place? If not for the 15+-year-old decision for Link to bypass Convention Place, would buses have likely remained in the future or were they always going to come out just whether it was after 10 years, 30 years or 50 years? I had also heard there was a plan for a direct connection to Century Square from Westlake that wasn’t built. I remember when the tunnel was only open M-F 6am to 7pm and was kind of a secret tunnel under downtown unless you knew about it, which all seems hard to believe now. The original 1996 plan for Link had a station at Convention Place, followed by *First Hill*, with a long bend connecting them. Maybe we should have a history article on the DSTT. It was designed in the 1980s. Seattle was still recovering from its 1960s-70s population loss, when it went from 550K to 410K. It didn’t reach its former peak again until the late 1990s, and has now reached some 725K. Most of Seattle was 1-4 stories, although the taller apartments in First Hill and Summit had been built decades earlier, along with a few scattered buildings. The Electra near Convention Place was one of the first condos downtown, built in the 80s or 90s. A plethora of similar buildings went up in the 90s, in both Seattle and in suburban downtowns, but they were still in the future when the DSTT was built. So Seattle had lost population and was really lowrise. Even before that, in the Seattle was highway-happy, and a video at MOAHI during the World’s Fair shows the mayor and council saying that I-5 and 520, still in planning then, were the greatest things coming to Seattle. Yet it was clear that the growing region would need high-capacity transit. The original vision for the DSTT was that buses and later rail would connect to the I-5 express lanes. That was the main reason for Convention Place Station, and why the tunnel turned east rather than continuing north through Belltown. A second reasion was the belief that conventioneers would use it en masse. At the time, several subway measures had failed, from the 1920 Bogue Plan to the 1972 Forward Thrust. But a later DSTT measure passed. The “region” was King County then, and the “regional” Metro agency was in practice within King County. Metro later merged with the King County government. Others can explain the details of the DSTT better than I can, and there are some disagreements about what happened and what was intended. But what I remember is, the first proposal for bus operations was to have separate trolleybus shuttles in the tunnel. There would be large transfer stations at Intl Dist and Convention Place for the regular buses to connect to. This was rejected because commuters didn’t want to transfer. Another early drawing has route signs with several existing West Seattle, Ballard, and Burien routes in the tunnel, and a larger number of total routes than there actually were later. Those may be just abstract placeholders or they may show the early ideas for the bus-route scope. But what actually happened was, when the tunnel opened in 1990, a select set of expresses went into the tunnel, and every part of the county was given at least one. So it was similar to the later RapidRide A-F lines that were distributed across the county. 106: express to Albro exit, then Myrtle/Othello Street, Rainier Ave, and Renton Ave to Renton. 107: express to Rainier Beach, then Myrtle/Othello Street, Rainier Ave (south shore of Lake Washington which has no bus service now), to Renton. Plus several peak expresses to northeast Seattle, Aurora Village, Eastgate/Issaquah, and maybe others. Before the DSTT, the 71/72/73 were a spaghetti of locals and expresses, the 70 was a daytime express on I-5, and the 74 had an all-day local to downtown. The DSTT streamlined this to daytime express only every 7-15 minutes, reverting to Eastlake locals evenings until 2am. The 70 trolleybus was created to take over local service on Fairview/Eastlake. Renton had a local 142 (MLK, Renton Ave), and I’m told there was a predecessor to the 101. Bellevue had two hourly milk runs; the 226 from downtown to MI, Enatai, Bellevue, NE 8th Street, Northup Way, 156th, Redmond; and the 235 on downtown, MT, Beaux Arts, Bellevue, north Bellevue Way, Lk Wash Blvd, Kirkland, Rose Hill, Totem Lake. The vision for the tunnel included eventual conversion to rail, but that was far in the future and nobody knew if it would ever happen. The assumption was probably heavy rail like MARTA (who got the federal funding when Forward Thrust failed), or a light rail like MAX or the San Diego Trolley or some German cities. The thought was that it would go on the I-5 express lanes to Northgate. The builders installed shoddy tracks just for show. They weren’t high enough quality for real rail, and they failed to anticipate the low-floor revolution that would require sinking the trackbed several inches. Sound Transit didn’t exist then, To get to Everett you had to take a milk run on Aurora to Aurora Village and transfer to a local CT bus on 99 to Everett. Both of these were half-hourly To get to Tacoma, you had to take a milk run to Federal Way and transfer to the 501 to Tacoma. Bellevue had two hourly buses alternating. Issaquah had a godawful 90-120 minute milk run that went all the way to North Bend. That’s what led the public to demand real regional transit, and I think they voted for DSTT in 1990, the year the DSTT opened. ST Express started in 1994. Sounder started maybe a couple years later. The initial Link segment from Westlake to TIB opened in 2009, followed six months later by SeaTac. The DSTT was designed for joint rail-bus operation, but I think long term they expected to convert it fully to rail. Of course, long-term they also expected more than one line, to go to the quarters of the county the buses did, so there would be no need for buses in the tunnel then. This pic is from 1994 in the tunnel. The route 227. Bellevue route? I’ve never heard of the 227. It must have been a peak express. Look at how ugly the white and yellow color scheme was. I like the green and yellow and other recent designs better. Oh, wait, the 225, 227, and 228. They were peak expresses that went on 148th. 156th. and 164th Ave NE. I don’t remember which was which. There was also a 220 on 140th, although i don’t think it went downtown, at least not in its later life. They were deleted in one of the restructures, with some protest. Maybe the RapidRide B restructure? I believe when Sound Transit began, the 226 became the 550 with little to no changes. In fact, for the first few years, the 550 kept Metro’s fare structure rather than ST’s. The 550 did have as little service as the 226 the first several years, and charged the Metro fare rate because of it. The 226 and 235 must have been in the tunnel but I have no memory of catching it there. In contrast I remember the many times I took it from 2nd & Union. There’s just a gap between taking it on 2nd and taking the 550, and I don’t know why I can’t picture the 226 in the tunnel. Or rather, as little service as the 226 and 235, meaning it was half-hourly. So if the period was 1990-1994 or 1999, I was living in the upper U-District, so I must have taken the 271 most of the time. The RTA which became known as Sound Transit was officially founded in 1993 when King, Pierce and Snohomish Counties adopted the JRPC transit plan. AlexKven reminded me, why was Convention Place abandoned? So the original vision was that trains would go from Convention Place to the I-5 express lanes. The first ST proposal did that, with a 45th freeway station for the U-District, and an Eastlake station for Eastlake (and not really Capitol Hill). Urbanists blew their top at that, and insisted it must have an underground station at Broadway and University Way, like BART did in the Mission District and Berkeley. We successfully got Link rerouted there. There were several evolutions of that idea, but the one relevant to Convention Place Station was that the plan backtracked from Westlake to First Hill and then zigzagged to Broadway. The engineers determined that the angle from Convention Place to First Hill was too sharp for light rail, so Convention Place Station was dropped. Later First Hill was dropped too, because the engineers found the soil under it was risky. ST had been through a budget crisis in 2000 caused by overoptimistic naiive planning, so the last thing it wanted was the risk of cost overruns, so it dropped First Hill Station. With that and the change of the Ship Canal crossing from Portage bay to Montlake and the dropping of Broadway & Roy station (since it would no longer run under Broadway), that led to the current alignment. All that happened in the mid 2000s around the time of ST2. I wasn’t in Seattle, but I think the use of dual-mode buses also seems to play a role. There were no CNG buses in normal use when the DSTT was designed. They had to go from diesel to electric trolley wires somewhere, and CP and ID were the ventilated places to do that. 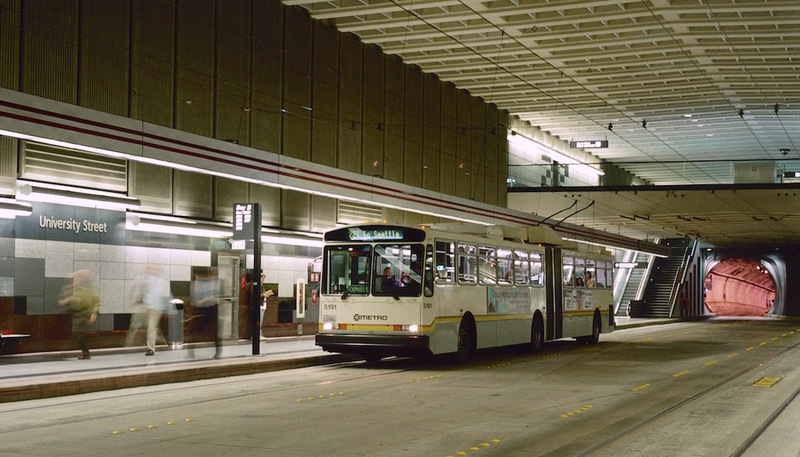 The dual-mode buses were the solution after the proposal for trolley shuttles in the tunnel was abandoned. It was built as a bus tunnel. Rebranding as a “transit tunnel” so ST could steal it came later. Late in the process councilman Benson insisted on rail being place “for the future”. That cost extra money then and extra money later when it had to be torn out for Link because it was at the wrong elevation. Long story short, ST stole the bus tunnel and transit is screwed for the majority of King County. When they were building the tunnel, I went on one of the tours where we entered the Pioneer Square station excavation, and then walked partway down the tunnel where it went under the BNSF tracks. The project manager giving the tour showed us how they originally cast all of the floor for the tunnel with a 1’x1′ trench. At the time of the tour, they had already decided to be flexible enough that if they wanted rail in the future, they could just remove the blocks, and be able to install the proper rail infrastructure. As the project progressed with no decision being made, nor ballot proposal being considered for a rail system, putting in rail was really a symbolic gesture. The project manager had worked on the original Wash DC Metro system. They knew how to install the rail correctly, and I’m sure he was being told to keep it “within budget”, had the proper read on the politics. Hence, why the rails were just cast in the concrete. Back then, all the light rail vehicles were high floor, with stair-step boarding. Just like Portland’s legacy Max cars. The new low-floor railcars hadn’t appeared on the scene, yet. Unless someone possessed special predictive powers to know that Sount Transit was going to be invented, everything else is amusing ‘armchair quarterbacking’. This is the sad truth. It may have always been planned to have rail in there but they screwed it up. Hence the2 year closure and rebuild. Ever since then bus service has been slowly bleeding out of the tunnel. Anyone else remember the194?? It served the airport better than link ever has but was sacrificed to the great light rail God. The 194 ran every 15 minutes daytime, 30 minutes evening and weekend, and stopped running at 9:30pm. If you had an evening arrival, you had to take the 174. Also you were always in danger of missing your flight if there was a backup on the freeway so you had to leave extra early. The only advantages the 194 had was it was 10 minutes faster if there was no traffic, and it stopped closer to the terminal. That’s not enough to say we lost something major and Link is worse. I spent decades wishing we had rail to the airport like Chicago, Oakland, JFK, London, Duesseldorf, etc. If a city didn’t have it, that was one less reason to go there or live there because they didn’t prioritize transit. Likewise I can’t believe Bernie saying rail wasn’t the ultimate goal, that ST stole the DSTT, and that we’re worse off because of it. Rail was always the ultimate hope, we voted ST into existence and gave it the Link mandate, it was always clear that if Link was built it would be in the DSTT, and the county is much better off. Sorry Kent-Des Moines Station isn’t open yet; it’s coming. Which Metro bus ever ran every 10 minutes at 9:30pm, had limited-stop service, gave Rainier Valley direct transit to the airport, can go from Westlake to UW in 6 minutes, and Broadway to UW in 3 minutes, connects the 13 Link stations all with one vehicle allowing the advantages of overlapping trips and more frequency, and has many more stations coming? Come on Mike. Rail may have been the ultimate hope of some, but Benson was the only person on the council — and pretty much the only representative — who was pushing for the tunnel to eventually be used as rail. Everyone else was focused on it as a bus tunnel. I’m not saying that the eventual transition to rail is a bad idea — it makes sense to connect downtown, First Hill, Capitol Hill and the UW via rail. But other than laying rail (which was done incorrectly) not much was done to accommodate its future use for rail (and that was done largely to please Benson — it didn’t cost much after all). The station was designed with fare turnstiles in mind, but that could have been used for buses too. We went with a proof of payment system instead. That would have worked fine for buses as well (I think it is ironic that we are moving towards off board payment on Third, when we could have done that for all the buses in the tunnel, but that is yet another example of the short term thinking that surrounded joint operations). In any event, the stations themselves are very wide, with entrances on the side. This allows buses to pass buses (as shown in the video) while allowing regular buses to use each station (no need for buses with doors on each side). But it has resulted in worse station design from a train standpoint. It really was not designed to work well as a rail tunnel. The fact that one of the stations is being abandoned is a good example of this. It really makes way more sense as a bus tunnel than a rail tunnel. It connects really well with the freeways and with the SoDo busway. The ability to pass makes for very high throughput (the bus tunnel never came close to capacity). It would have made the most sense to just continue to use it as a bus tunnel, but build another rail tunnel next to it, but with additional downtown coverage (e. g. on First Hill). That would have cost a lot more money, but it turns out we are spending that money anyway, and getting less for it. Of course that is all hindsight. It is tough to criticize the folks who converted the bus tunnel to a train tunnel. I would have done the same thing (but started with First Hill, Capitol Hill, UW). It is by no means the worse mistake made by Sound Transit, and probably the most excusable. Where would the turnstyles have been? In front of the escalators at Westlake? That would have left out the elevators. Would the elevators have had their own turnstyles? The only reason to have the gigantic mezzanines is to have turnstiles. Where exactly they would be is hard to tell without a good map or better memory than I have. Not where they were on the map, if they were there. Where would be good places for them, and how many would you need. The mezzanines are what allow you to change direction if you;re transferring to an opposite-direction route, you went down the wrong side, or you changed your mind on your destination en route. They also connect the department stores and allow you to cross 4th & Pine without a stoplight, or to get to a train from the opposite side of the street or kitty-corner. I’ve started using them whenever there’s a demonstration or parade on 4th because it may take a long time to get through the people on the surface. That’s simply not accurate. The three counties adopted the JRPC system plan in 1993 which gave life to the RTA that eventually became known as Sound Transit. The state legislature set the table for this by first creating and then modifying the authorizing legislation (RCW 81.104) in 1990, 1991 and the most important changes made in 1992. Someone a while ago linked to this early video: https://www.youtube.com/watch?v=etT_wVuKy_I. You can see how buses could pass buses, which explains why each station is so wide. That is one of the things about the original tunnel set up I didn’t remember. It is interesting to see it. Thank you. The original DSTT plan was to run both busses and trains simultaneously, as in busses and trains would freely comingle and stop at the same stations in the same directions at the same time. In the early 1990s, the Federal Government made this practice illegal. Seattle asked for a grandfathering waiver, took the fight all the way to SCotUS, and lost. This is why we have the busses and trains blocking each other, something that wouldn’t have happened under the original plan. Sadly, the 1990s weren’t as Information Age oriented as today, making the evidence trail for this beyond my Google Fu. Late addition to the spring service change: all former Viaduct routes will now have a stop in Pioneer Square at first and King, giving gobs of service to an area previously separated from transit (unless you count the streetcar on Jackson) by the elevated 4th Ave on the west and stadiums to the south! Yeah!! Sitting on the bus for 10 minutes passing through Pioneer Square and South Downtown, until the 1st stop at 3rd & Madison, has been painful for us with S. Downtown destinations. Why are Portland’s food trucks better than Seattle’s? I’ve had excellent food from that food-truck village at the south end of the streetcar and some trucks downtown, comparable to a $10-20 restaurant with an exceptional chef. I’ve never been able to find anything like it in Seattle.What are we missing, besides the number of trucks and villages? That would be an interesting question to ask the “Dr Know” column in Willamette Week. One thing is that vacant restaurant space is pretty scarce here, but surface parking is everywhere. There are a number of really odd shaped lots where nobody has figured out what would work there and still meet the zoning requirements (this is the case with the cart pod at Hawthorne & 12th as well as the one that uses to be at 50th & Division) so they do food carts instead, until something gets figured out. The food truck pod at the Milwaukie MAX station will probably always be that as it’s too small and odd shaped for much else. So, if someone wants to try something different here, it’s a lot easier to get a food cart pod spot than a full blown restaurant. In some cases, full restaurants have food carts, because it’s the only thing Portland zoning allows. El Pato Feliz has a food truck in inner southeast because the small patch of land under it is still zoned as farm land so a permanent structure isn’t allowed. Gigantic Brewing has a food truck because they are allowed to serve their own alcohol, but through some restaurant food rule they apparently aren’t allowed to do food preparation. So, they provided a spot for a food truck instead. Aren’t there a bunch of odd shaped lots on ML King along Link nobody knows what to do with? What about the “basement” of the Mt Baker Link Station? If those spaces were in Portland they would probably be food cart pods. I’ve always though there should be a farmers’ market under Mt Baker station. It’s silly to leave it empty all the time. About the only thing to do there is to look at the Olmstead park history sign. Soundtransit should solicit ideas from the neighborhood for the use of that space. Evidently buses will never use the space, so let’s do something! Maybe it could be rotating food stalls for as a sort of night market. That was sorta the idea with the food cart pod at the Milwaukie Main Street MAX station. There’s really not much else you could do on such a small and odd shaped triangle, but if someone ever did want something else there the whole thing is pretty easy to move. I think the only permanent structure is a fence. We keep having all these conversations about the continued growth of Seattle but we rarely talk about the largest single development going on in our city. 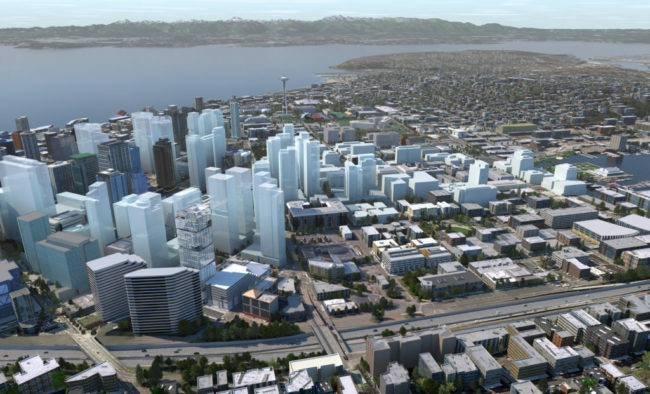 Maybe the proposed Smith Cove station should be a few blocks North (Home Depot area to maintain connection to Expedia) to spur the largest TOD project in the region. I think it would make more sense to just have a provisional station in the middle of that area. If the area gets developed, then build an infill station. If it doesn’t, then don’t. So basically a station at Prospect, and a provisional station at Newton (just south of Whole Foods). That would be pretty good stop spacing (no overlap). Random question, how do buses kneel? The reason I ask was that my spouse was recently walking along the sidewalk near a bus stop. A bus arrived and kneeled. As it kneeled, my spouse got “sprayed” with a white powder from the bus and their face was itchy most of the day. After that, the irritation seems to have gone away. I assumed the bus kneeled by expelling air, so I have no idea what the white powder is. Airbags use sodium azide (a highly toxic white powder) to inflate, so I really hope it that’s not what they were sprayed with. The sodium azide is an explosive compound that can only be used once. Once it blows up, you can’t do it again. “Air bag suspension” is in fact air that’s been run through an air compressor and isn’t the result of combustion of anything. The white substance was probably something that happened to be on the road under the nozzle that lets the air out of the air bag suspension. Today was also the first Saturday with route 542 service. I had a trip this morning from Kirkland to near the UW, and I thought I’d see firsthand how bad the 255->542 transfer would be, before actually being forced to do it, when Montlake Freeway Station closes in June. The good news is that whoever wrote up the schedules obviously thought about it – on paper, the connection window at Evergreen Point is in the 5-10 minute range for both 255->542 westbound and 542->255 eastbound. The bad news is that the 255 is unreliable enough to make even a 7-minute connection window a crapshoot, fighting downtown traffic in the eastbound direction, and coming all the way from Brickyard in the westbound direction. For example, on my trip westbound, the stretch of 108th Ave. north of South Kirkland P&R, we kept stopping to let person on in single-family-home neighborhoods, where the bus would typically blow by all the stops. Many of these people had either strollers or mobility challenges, forcing the bus to stand still until they completely took their seats, so each stop to let one person on board took over a minute. On top of that, we missed every single light, and, as it turns out, I watched the 542 zoom by on the freeway, while waiting for the light at Northup Way. Thankfully, Montlake Freeway Station was still open, allowing me to stay on the 255 to Montlake and switch over to a Lime bike. Otherwise, the choice would have been to be stuck at Yarrow Point for 28 minutes, or pull out my phone and summon an emergency Uber car to take be across the bridge (which would have costed almost as much as just riding the Uber from home to begin with, and not riding the bus at all). When I got off at Montlake Station, several others got off with me, and had Montlake Freeway Station been closed, every one of them would have gotten stuck too. (Although, at least we could have shared the Uber/Lyft car to chase after the 542 and split the cost). Eastbound, came back a different way, getting on the 255 at Olive Way. Along the way, I monitored the progress of my bus and the 542 that was supposed to meet it with OneBusAway, to see if the connection would have actually worked. As it turns out, the schedule is quite optimistic in the 255’s travel time through downtown, but has a ton of excess padding once the bus reaches the freeway. Enough padding, in fact, for my bus to go from 5-7 minutes late leaving Olive Way to 3 minutes early by the time it made it across the bridge (for my trip, I-5 happened to be wide open). Turns out that someone riding the 542 from the U-district would have *barely* made it to Yarrow Point Station on time, with about a minute or two to spare. A Montlake Bridge opening to let a boat go through, and they’d be out of luck. I haven’t gone through the trouble of collecting OneBusAway data to get a statistically significant sample as to estimate the probability that the 255->542 connection can be trusted in either direction, but I’m guessing the success probability to be around 75% or so. One may say “well, just adjust the schedules and increase the padding time”. The trouble is, increasing the padding time means you have to wait longer whenever the first bus is on time and the second bus is late. This is also not hard to imagine, especially eastbound, if there’s any kind of event going on downtown, or any kind of accident on I-5. In fact, I don’t think there exists *any* way to prevent 20-30 minute waits 20-30% of the time, simply by shifting schedules around. The bottom line is that the transfer just doesn’t work because the 255, as currently implemented, is simply not reliable enough to support transfers. The proposed service restructure cannot come soon enough. It is very difficult to have timed transfers involving a typical bus. Real BRT, sure, but not your average bus. There are just too many things that can go wrong, as you mentioned. If you add padding, then you increase the amount of time someone has to wait. The best answer is to increase frequency so that it doesn’t matter. As long as the buses don’t bunch, it works out. You could be expecting to take the 4:15, but you are actually taking a very late 4:05. No big deal, as long as the 4:15 isn’t right behind it. If I’m not mistaken, the most frequent bus from the 520 corridor to the UW is the 271. Yet the 271 doesn’t serve Evergreen or Yarrow Point. Thus for transfers like the one you described, you go from a pretty good combination (271 + 542) to something terrible (just the 542). This is an enormous network mistake that should be fixed. It wouldn’t be that hard, either. Just add an infrequent coverage bus for one of the least densely populated parts of Bellevue, and then have the 271 get on 520 earlier, so that it can serve Evergreen Point (if not Yarrow Point). The hyperlink for the profile on Cathy Tuttle isn’t working. Where was it posted?